The Memorial Arch was originally erected in memory of those from the district who died in service or were killed in action during World War One and lists the names of the fallen. 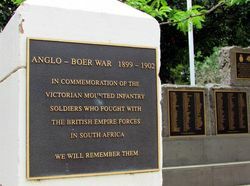 Additional bollards were placed on either side of the arch to commemorate those who served in the Boer War and World War Two and the memorial was rededicated on the 27th March 2007 in remembrance of the 80th anniversary of the original dedication. 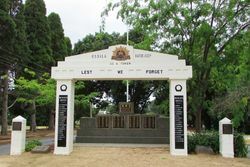 The arch was originally erected at the entrance to Whittlesea Park and relocated to its present position near the former World War One Avenue of Honour which no longer exists. 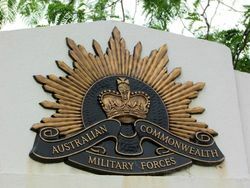 Whittlesea, Monday - His Excellency the Governor (Lord Somers) visited Whittlesea today to unveil the soldiers memorial arch erected by the branches of the Returned Soldiers' League and the Father`s Association. The arch, with its supporting columns is of dressed freestone on a granite base. 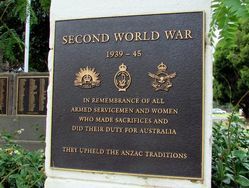 It has been placed at the main entrance to the Whittlesea Park. It bears the names of 35 soldiers who died in the Great War. The arch and its columns support double gates and two hand-gates of ornate beat iron work. Children from eight schools formed a guard of honour and sang the National Anthem. Lord Somers in performing the ceremony, said that memorials formed a link of Empire. The archway was particularly significant because it implied a new way to travel to something greater and better. It suggested that there was still work to be done to make the world better and happier. Lord Somers placed two wreaths of laurel on the arch. He was afterwards entertained at luncheon. The Argus (Melbourne), 8 March 1927. The Whittlesea sub-branch of the R.S.S.I.L.A. has taken up the matter of the Avenue of Honor and the Memorial Archway, which are showing signs of neglect. The Avenue of Honor consisted of 36 trees, each bearing a name-plate in memory of a fallen soldier, corresponding with the 36 names on the Memorial Archway. Twenty trees together with the name plates are missing. A meeting is being called for the appointment of trustees. In the meantime the League is arranging for the replacement of the missing trees. Advertiser (Hurstbridge, Vic), 9 August 1935. At a meeting of the R.S.S.I.L.A sub-branch on Monday night, it was resolved that a working bee be arranged for Saturday when new trees of the plane variety will be planted in the gaps of the avenue of honor in Walnut street. For this purpose the Country Womens' Association donated £15. Advertiser (Hurstbridge, Vic), 22 May 1936. PROFESSOR DAVID de KRETSER, A.C.